Vertoz's startup journey - From a small business to an IPO listed firm. 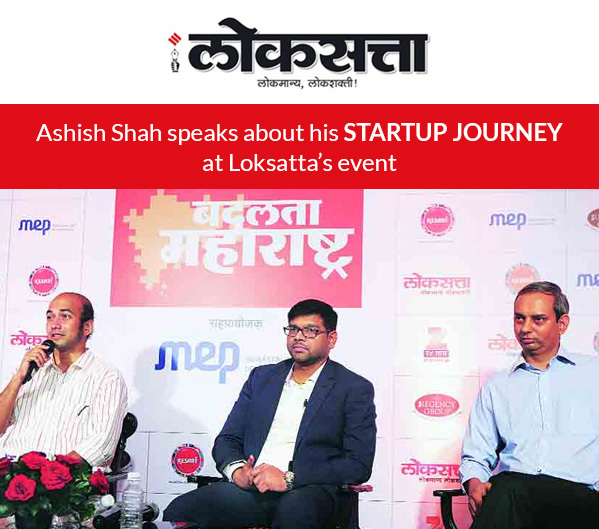 During Loksatta’s panel interaction, Vertoz CEO, Ashish Shah shared thoughts on how it all started from a small initiative to the birth of a successful online advertising business – Vertoz. Ashish has come a long way; since his childhood he had always dreamed of being a successful entrepreneur. At a very young age, he and his elder brother Hiren Shah used to support their father in his business. Enthusiasm for technology grew when they both were quite young. At the age of 18, his brother Hiren had to leave his studies to pursue his dreams of starting his own business in the growing field of technology. In this interaction, Ashish mentioned that, in the year, 1998 they launched a website called IndiaFreeMail.com. The idea behind it was to deliver free postal mail from people located across the globe to their families in India. Before this, delivery of regular international postal mail used to take approximately 40 to 45 days. At that time, it was difficult to communicate and the process was very slow. They didn’t predict ROI properly and they started making losses. To overcome these losses, they thought to print an advertisement behind every letter posted and earn for that advertisement. However, that idea also failed miserably. But Ashish perused that idea and started an online advertising business Vertoz in the year 2012. From this incident, they learned how to register a website, i.e. domain name and procuring web space. In the year 2001, they started with a domain registration and web hosting service company called QualiSpace. Through their years of learning, they have built strong experiences and have launched several technology businesses under their parent company Trunkoz Group. In this interaction with the audiences, he gave advice to upcoming entrepreneurs: Try to build unique product or service or reinvent the process of existing product and service. Always choose the business which you can scale, always think from the first day as how would you grow. It is necessary to hire right kind of people. Build up reserves of money to support you in bad times. Never give up until you can support. Loksatta is one of the most widely read Marathi daily newspapers in Maharashtra, India. It is published by The Indian Express Group. Loksatta is known for its dynamic editorial team that generates factful content which acts as the benchmark for the competition. They organized an amazing “A Startup Gala” for B-school students, where they involved great leaders and entrepreneurs across India to impart their valuable knowledge and stories. They tagged that event as “From Failure to Success”! Leaders like Abhishek Arun (Vice President, Paytm Bank), Ashish Shah (Founder, Vertoz), Kiran Patil (CEO, Willmart), Shailesh Ghorpade (Manager, Partner and CIO, Exfinity Ventures) and many more.